This site is valuable on its own, but is even more valuable as a contributor to the greater Neawanna system. A unique partnership between conservation and development has allowed for this sub-watershed system to maintain its ecological integrity and hydrological connections while a community of homes was built alongside the project. Thompson Falls is an example of using green infrastructure as a framework for strategic conservation planning which allowed for connecting estuary, wetland, stream, and forest. This site is valuable on its own, but is even more valuable as a contributor to the greater Neawanna system and the Coastal Estuaries Initiative. Thompson Falls is adjacent to and contains a portion of the Stanley Marsh estuarine system located in the Neawanna watershed. A large wetland meadow is adjacent to the ‘lake’ and receives its hydrology from 3 main draws coming off the hill slope. These draws attract birds and beaver, with one draw containing over 15 beaver dams. 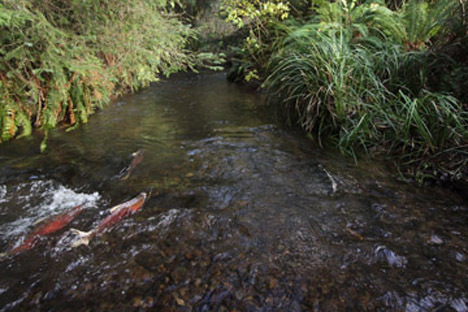 Thompson Creek is a salmon-bearing stream that runs through the property. This stream consistently sees some of the largest numbers of spawning Coho in the entire Neawanna system each fall, and has the added beauty of a waterfall just beyond the property border.